The new Government of Nerendra Modi, whose track record in the state of Gujarat promises the unleashing of India's economic potential, means the country is fully open to business. With a huge Muslim population India remains vulnerable to Islamic retrogression, social division and terrorism. Jan. 2, 2015 A 'bomb' boat with crew that didn't look like fishermen: Coast Guard Asserts vessel was set on fire by its crew members, causing it to explode and later sink. UPDATE: Indian Coast Guard (ICG) today said suspicions were raised about the identity of crew of the explosives-laden boat intercepted by them, as they did not resemble fishermen from their dressing style and carried no nets. ICG said they followed the standard operating procedure (SOP) while intercepting the hostile boat, which as intelligence input suggested, had set sail from the port city of Karachi from Pakistan for some "illicit transaction". The maritime law enforcement agency reiterated that the vessel was set on fire by its crew members, causing it to explode and later sink. The incident took place about 365 km off the coast of Porbander in the Arabian Sea on the intervening night of December 31 and January 1 after a hot pursuit by Coast Guard. (Source) A second boat may have been involved, apart from the one that was blown up. The Government of Pakistan is rejecting the allegations and speaks of slander. Islamic conquest of India. Bloodiest in the history of World (Source). It's a franchise, yah know! So here we have it: India, or in this case Kashmir, is like Israel. An infidel sore on the face of self proclaimed "Muslim territory". 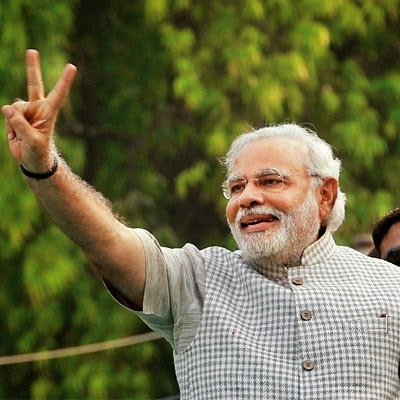 Narendra Modi flashes the victory sign at a rally after his victory on Friday in Vadodara. More than half a billion Indians, a record 66 percent of eligible voters cast ballots at some 930,000 polling places. Results released Friday show the conservative Hindu nationalist Bharatiya Janata Party (BJP) and its leader, Narendra Modi, won more than half the seats in parliament, the first time in 30 years a single Indian party has won enough seats to rule without coalition partners. Modi hugely appealed to young voters and ran on a message of change, expanding economic opportunity and making government more responsive. In 12 years as Chief Minister of the western state of Gujarat since 2001, he developed a reputation for getting results and fostering economic development, job creation and improving infrastructure. Many who know him describe Modi as a rapt listener, who will give you his entire attention. He uses multiple sources of information and that is also his strength because he knows in detail about individuals he is meeting or events. With a long coastline and too little rain for decent farming, Gujarat has always been famous for its traders. When it split from Bombay to form a separate state in 1960, "the question was how Gujarat would survive," says Narendra Modi in an interview a few years ago. These days Gujarat accounts for 5% of India's population but 16% of its industrial output and 22% of its exports. Its growth has outpaced India's and it wins accolades from business people. A recent comparison of Indian states by consultancy McKinsey was lyrical about Gujarat. It might yet play the role of industrial locomotive for the country, as Guangdong province did for China in the 1990s. There is lots of excited talk about exporters switching from China to India. Former US ambassador to India Thomas Pickering says India can get back to growth rates of 7, 8 or 9 percent under a Modi government. Chinese-style projects are part of Gujarat's formula, including refineries and ports, but so are networks of smaller firms and foreign companies which have now achieved critical mass in industries such as cars and pharmaceuticals. The state government has provided the standard things that businesses pray for across India but often do not get—less onerous labor laws, passable roads, and reliable electricity. For all the good Modi has achieved, the US refused him a visa in 2005 because of his alleged role in riots in 2002 in which more than 1,000 Muslims were killed in Gujarat. Modi has denied the allegation. In 2013 the annual Wharton India Economic Forum (WIEF) hosted by the Wharton School of the University of Pennsylvania, canceled the keynote address Modi was invited to give via videoconference. The recent politically motivated cancellation of Ayaan Hirsi Ali's honorary degree at Brandeis springs to mind. It’s clear however that the new PM of India’s 60-year-old democracy has at least three attributes that his predecessor Manmohan Singh lacked. He is his own man, he is a sharp political strategist and he is an ace communicator. That he will make his presence felt is not in doubt. He said he would work for the people. That's not a promise so much as the statement of an ambition. Al Jihad Threatens to Bomb US Consulates in India!